Charge your Phone at the Same Time thanks to the build-in fully powered USB port. Simply add a phone charger during checkout! Universal Laptop Charger: Compatible with All Models with up to a 120W output, higher than a typical charger - thereby supporting everything from netbooks and ultrabooks to extreme-performance gaming laptops. Intelligent power switching is possibly the most important safety feature we have on our laptop charger. Many high street models, especially cheaper ones, have manual switches that require you to select the appropriate voltage or current with a screwdriver. Simply selecting the wrong option or having it nudge out during transport can be the difference between a working and a completely broken charger - or worse, a damaged component in a computer. When you buy laptop charger, make sure safety and reliability is top of your priority list. 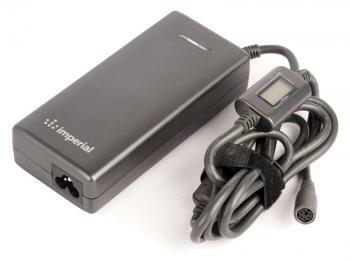 Imperial Gadgets' universal laptop charger ensures that you won't have to worry about such things by automatically detecting the power requirements of your portable computer using intelligent laptop heads. Every head is L-shaped to help prevent accidental disconnects as well, and designed to keep power seamlessly running through your laptop at all times. The power supply unit itself weighs in at just about 900 grams, which is extraordinary given the number of safety features built into the charger. In addition to this, a built-in USB port allows for the simultaneous charging of other devices such as mobile phones. This means that you can charge two devices at once and not have to bring two separate chargers - making it ideal for places such as work or bringing while travelling so you do not need to remember to bring the power cables for different electronics! Finally, the built-in LCD screen allows you to see the voltage that is being supplied by both the charger and the USB port at all times - a great little extra for guaranteeing your charger is always working as it should be. When you buy universal laptop charger, you can buy with confidence here. There are a number of safety standards that, if we chose to ignore them, could make our charger both cheaper to produce and lighter. Of course, we do not cut any corners and make sure that our universal laptop charger is a product that people would be proud to own. For instance, we utilise a light-weight method of creating ultra-thin polymer layers inside the charger itself, such that there are actually over a hundred layers of insulation and surge protection built into the unit directly without adding a substantial amount of weight - which is one of the many ways we keep it under just 900 grams. We also fully compliant with European Restriction on Hazardous Substances legislation - this is important because sometimes it's simply cheaper to manufacture products - especially electronics - using raw materials that quite frankly can be hazardous to the environment. We ensure that we meet all these standards and exceed them where possible to give the highest possible quality product - something that you could genuinely think would cost £80 in an overpriced-high-street-chain store but is both excellent to use and great value for money when sourced through us. 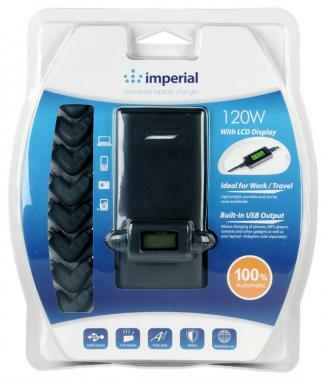 Will Imperial Gadgets' Charger Work With My Laptop? Yes! No problem, Imperial Gadgets has you covered. What Does The Charger Come With? The charger package itself comes equipped with eight common laptop adapter tips, but don't worry - if you've input your laptop make and model at checkout, we include the extra laptop adapter tip you require in the package itself! 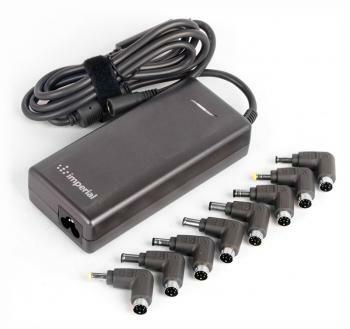 The eight included laptop adapter tips are N04, N06, N07, N09, N13, N14, N18 & N19. 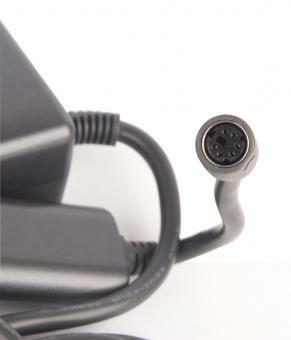 Check out the Laptop Adapter Tips page here for which laptops these adapter tips charge. If you need more than the one extra tip (i.e. you run a business and need one of everything, etc.) we can supply these too at a discount if you buy them together with a laptop charger - simply choose the ones you want from the laptop adapter heads page. Apples (including MagSafe! ), Netbooks and Ultrabooks are also all compatible with the Imperial Gadgets' premium charger.